A brand-new Instant Pot, ready for action. Does it feel like everyone you know just got an Instant Pot? The seemingly ubiquitous Canadian-designed multicooker has become a kind of cult in the US, its devoted followers sharing a sprawling scripture of recipes for stews, risottos, and braises. The appliance has inspired hundreds of cookbooks, turned home cooks into micro-celebrities, and attracted 1.3 million to the cooker’s Facebook page. 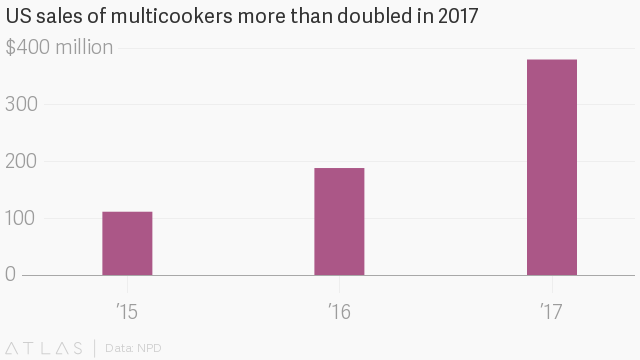 It has also made it necessary to consider “multicookers” as a new market category, and compelled the research group NPD to count sales of this invasive kitchen appliance, starting in 2015. In the twelve months prior to December 2017’s holiday shopping spree, US shoppers had spent nearly $380 million on multi-cookers (including but not limited to Instant Pots), according to NPD—sales growth that looks when charted like the beginning of an exponential curve. The maker of the Instant Pot doesn’t disclose sales figures, but told The New York Times that sales of the machine have more than doubled every year since 2011. The Instant Pot was already on fire in 2016 when people purchased some 215,000 of the multicookers on the one-day-sale event of Amazon Prime Day. In 2017, the Instant Pot was Amazon’s most gifted item on the site’s wedding registries, the most wish-listed item all around, and a top-five seller. And there’s room for continued exponential growth: Your Instagram feed may be clogged with pressure-cooked carnitas and butter chicken, but only 11.5 percent of US households have a multi-cooker to date.